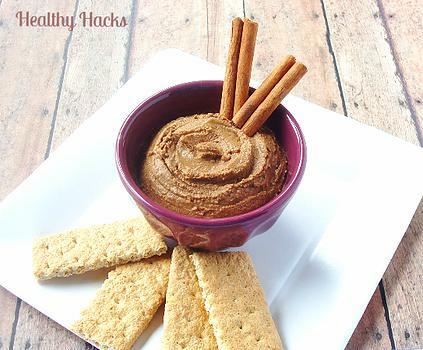 You won’t believe this quick and easy snickerdoodle dip is packed with protein. This cinnamon-y, cake-y goodness can be used as a dip for crackers or pretzels, spread on toast, or just eaten by the spoonful! What is the difference between a sugar cookie and a snickerdoodle? As far as I can tell, the only difference is a snickerdoodle has cinnamon added to it. Someone help me figure out this mystery! Am I missing something? What I do know to be true is that cinnamon and sugar are a match made in heaven. But, the best part about this amazing dip is that it has that sweet, snickerdoodle taste without being loaded with sugar. The brown rice protein also gives it a great cake-y texture. This dip is so versatile, it doesn’t have to be limited to just dipping. You can spread it, top it, swirl it, spoon it, bop it. Wait…bop it? I think I just flashed back to my ‘90s childhood. Am I showing my age… is anybody with me? Mix with an electric mixer until all ingredients are incorporated and dough is smooth. Get your crackers, pretzels, or just plain ol’ spoons ready and eat up!